The Prince Memorial A-bomb exploding, there, in the background, Making doves cry, probably, as it does so. Yellow Eyes was definately a worse cover (same authors). You so know there would be swastikas EVERYWHERE on the cover and the tank dude would be giving the olde “Hitler salute” if it wasn’t for the fact they actually want the book to be able to be sold in Germany. It’s not one of those alternate history fantasy books that suggests that Nazi Germany “wasn’t really all that bad”? I do remember someone somewhere saying that Ringo was involved with a very, strange nazi book that didn’t go down too well in Germany. Probably someone commenting on yellow eyes. I could look… but that involves using my mouse. Audacious…not really…. Shocking… for teenagers… exciting… the chemcials in the cover burn with pretty colours. I’m slightly surprised that my flipant comment about it being pro-nazi seems to actually be true. Good Show Sir! Good Show! Difficult to talk about this one without talking about the book. Question: How do you get Nazis into your book in a way that allows you to get excited about their Teutonic prowess, their cool uniforms and their jutting chins? Answer: Have them brought from the past and employed against a sub-human but happily alien enemy that will eat us all unless Sepp and his pals in the Waffen SS (the good SS that it is, the army SS who were heroic and stuff). Kratman is outrageously right wing but this idea is pretty gonzo even for him. Back to the cover: We know this is in the future because they don’t need to camouflage their tanks in the future and they have biiiiiiig radars on them. And the Nazi tank commanders get to wear cool surfer dude reflective shades (a satorial elegance somewhat underminded by his mummy clearly having insisted he wear the chin strap under his peaked cap). Loving the strange swirly multi-coloured background though. @SI Thankfully no. Have had the pleasure of reading Kratman on certain forums though. CSA: The cover for Yellow Eyes, for the hardbound volume, was _appalling_. I think the only reason it got through was that Jim Baen had just died. You may not like the one on the paperback. Personally, I do. No, it doesn’t suggest Nazi Germany wasn’t that bad. Indeed, from Babi Yar to Auschwitz, we took some pains to show it as very bad. And the only unrepentent Nazi in it is shot down like a dog at the end by the (by the way, Jewish) guy on the cover. Is that the Wagner review? I got a tremendous kick out of that one. SI: Define “didn’t go down too well in Germany.” If 117 for all books in Germany, and #2 for books in English (right behind the then latest Harry Potter) is not “too well”…well, you’ve perhaps some unusually high standards. Or something. Belated Merry Christmas and Happy New Year, to all of you. Hello Tom, welcome to GSS. That review was indeed by a chap called Wagner. And i agree was funny to read but perhaps misrepresentative of the novel. I believe SI was quoting a user NIX from when we discussed “yellow eyes”, im not sure where NIX’s sources are, however perhaps his source assumes something can still be very popular and unliked at the same time. I think some of your books certainly seem to attract a divided opinion. Thanks for clarifying the book, but you spoiled the ending! I’ll have to pick up a copy of one of your books now you’ve posted. I guess i’ll make my own judgement after i read one. My suggestion would be A Desert Called Peace. If you end up liking that one, it’s already a series (two out, one more in April, another one sometime next year, and probably 4-5 more after that), and has the decided advantage of being out in paperback, hence _cheap_. (Course, a used hardbound might be cheaper still, and the libraries are most frugal of all.) Failing that, Caliphate is out in paper this February or March. I think what really annoys people – typically, if not always, on the left (there are a fair number of libertarians who loathe me, as well) – about my books are the afterwords. Which is why I generally include a warning and disclaimer at the beginning of those. But politics and philosophy are my motivations to write, and if I don’t put them in the afterwords, they tend to crop up altogether too much in the body of the work. Watch was an unusual case, German-sales-wise. It was doing nothing much, being in English and all, until a man who writes for the left wing German monthly, Konkret, one Dietmar Dath, put a wonderfully and viciously scathing review (though I think not a particularly accurate one) in the Frankfurter Algemeine Zeitung. That’s when it took off there, as well as in Japan and the rest of Europe. I have a copy of the review a German fan sent me. I really need to frame it and hang it on the wall. Yes, as a matter of fact that did make me fairly philosophical about negative reviews. I did write to the FAZ, asking them to pass on to Herr Dath that if I ever find myself in Germany again, the beer’s on me. Since the cover is mostly what you are concerned with here, I ought to mention that my cover artist, for everything except the hardbound Yellow Eyes and my first book (which is so so), is one Kurt Miller. Kurt is great, both for his work ethic and for doing precisely what a cover illustration is supposed to do, to advertise the book. i’ll pick up a Desert called Peace from amazon. But although i’m not one of the libertarians you refer to, my own political opinions probably fall pretty far left of yours. Im always willing to give it a go as long as its a good story. Personally i think the problem with making politics in novels a big issue, is that your always going to be chopping potential readers out of the equation if their own views differ from your own. Bad publicity is generally as good as good publicity, the Grand Theft Auto computer games would also never have been as popular if it wasn’t for ‘concerned’ parents and politicians. Its always good to see authors can take critisism. And i hope any editors and artists don’t take critisism too hard either. I agree Kurt’s art is really great http://www.kmistudio.com/ ,its more a matter that over here (UK), the trend is for more minimalist covers and there is an obvious difference in a UK bookstore which books are published by a UK publisher and which are US imports. I think with the ease of information from the internet its no longer necessary to have the brightest cover on the shelf with the most explosions and infact personally i’d rather have a plain yet stylish cover than a bright ‘loud’ cover that would initially catch my eye. btw i was taking to a friend about this topic and he’s read a few of your books and says they are good, but he’s a big fan of military style books which i’ve honestly never given a chance because its never appealed to me, but i’m willing to give it a go since you’ve made the effort to talk to us here at GSS. It’s almost impossible to avoid politics these days. Everything’s been politicized. As soon as you get to a big question involving groups and conflicts, to include differences of opinion; voila: Politics. Torture? How does one avoid politics while discussing torture objectively? I don’t think it can be done. Reprisals, same deal. If you’re building an army afresh in a Third World kleptocracy, how do you avoid the politics of the cracy of the klepts? I doubt it can be done. In a world where damned near every action by a major player has political implications, how do you make his actions logically consistent unless you give him (or her) a political philosophy? A little warning is in order. A Desert Called Peace and Carnifex were supposed to be one book. I hit 360,000 words and the publisher said, “Too hard to bind; split it into two.” Collectively, though, they’re a roughly half million word single book. The bad part of splitting them is that the preparation to action ratio in ADCP is unfortunately high, while the preparation and background to action ratio in Carnifex is nicely low. That can make ADCP drag in places, unless you are really fascinated by the nuts and bolts of creating a military force from scratch. Some people really liked that, and some it drove to distraction. A little addendum on covers, again, since that what you’re mostly concerned with here: Kurt and I work really closely on the covers for the ADCP series, which is why you’ll see a common pattern – a central emblem or feature, surrounded by 4 or so scenes from the book. They’re really hard covers to do, and very time consuming for Kurt. He does them because we’re friends and he likes the story. The statue in the center of ADCP is taken from one of my wife’s old modelling photos, which Kurt then turned into stone and added shadows to, since it is supposed to be in the central open courtyard of their house. This is her: http://www.tomkratman.com/yoli.html. Unless you’ve got the big framed print on the wall, you can’t tell how really outrageously, even painfully, good looking she is (was, but really still is, although she’s pushing 50; odd genetics, her grandparents had nearly four centuries between them, and that’s with Third World medical care). I’ve seen her literally cause traffic jams and accidents just by walking along the sidewalk. And she got progressively better looking for the first 24 years we were married. Even those pics on my site don’t do her justice. Still, it’s a nice looking statue. I suppose you are right in general about politics in fiction. I probably have double standards, i’ll happily sit through a season of 24 and watch Jack as he needlessly tortures for “the greater good”. But when Jack does it it’s generally against the rules of the established political power. I think your getting into dangerous territory in even in fantasy/sci-fi when torture is accepted as a good and normal practice. I think the problem with having characters represent a politcal viewpoint arrises when they stop acting like real people. Using the example of torture, average Joe american may agree that torture for the greater good is acceptable, but put the car battery or red hot poker in his hand and suddenly he REALLY has to think about where his morals lie. Also problems arise when you stereotype politics. The Liberals won’t fight and they’ll just sit and cry as the invaders walk in. While at the opposite end of the spectrum you have people torturing children in the name of patriotism. I don’t mind it in novels, i just would hate to think the author is trying to convice me that the torture is the right thing for people in real life to do. I’m pretty much rambling, but i completely agree what you are saying about it being impossible to avoid politics in novels on the large scale that you set them, but at the same time i think authors can fall into the trap of stereotyping once they start taking about politics. You’ve interested me though. I’ve ordered ADCP and will read it with an open mind. Although i can respect that the cover expertly drawn and its cool that you have a working relationship with the artist (which seems very rare in the publishing business) and so much time and thought has gone into it. All im saying is that what advertises and sells a book well in the US doesnt necissarily do the same everywhere else. One final point, i think because you have such a friendship with Kurt and he is a fan of your work, the covers actually mean something to the book. But very few artists really take the time to read the book and as a result the scene on the cover usually DOESNT happen in the book and characters portrayed there only have a vague resembalance. You’re pretty lucky to have Kurt. P.S. Smart move proposing to your wife so soon after meeting her! You know, I’ve never seen 24. Again, fair warning, the torture in ADCP is considerably more methodical and organized. Not everybody captured gets tortured. I gave the subject quite a bit of thought, though some of that thought only shows up inferentially. It all takes place on a ship out at sea. Nobody is tortured who has not been found guilty of a war crime and sentenced to death (which is almost a rubber stamp as the charge is generally “Conspiracy to conduct war in an illegal manner,” which _everyone_ on the other side is guilty of. And I figure if you can put someone to death you can do less than death, too). Everyone subject to torture is put to death and turned into chum after being wrung out. The numbers of people doing the work is kept deliberately low to help ensure that only those who are most likely to yield actionable intelligence get the treatment. And everyone gets the tour of what can and will be done (taking a leaf from the Spanish Inquisition) before any pain is applied. Some, many even, talk without pain. I don’t know that I’ll convince you or anybody that torture is the right thing, and surely not that it’s an inherently good thing. I couldn’t because it isn’t. I think I’ve succeeded, though, in making a fair number of people admit that it’s a lot more ambiguous a question than they’d have preferred to think. That’s good enough for me. I don’t think it’s a fair claim that liberals won’t fight. After all, they surely have, time and again. It is a fair claim that some of them won’t fight, liberalism being so broad an outlook, and that most of them (not all, see, eg, Alan Derschowitz) will be rather more squeamish about the methods of fighting to be used. It’s also a fair claim that some of the knee-jerk, generally Marxist, anti-Americans would fight, physically or with words and ideas, but only against the west and/or the US. They’re not liberal, though. Covers again…you’re probably right about certain types of covers doing better or worse in some places than others. 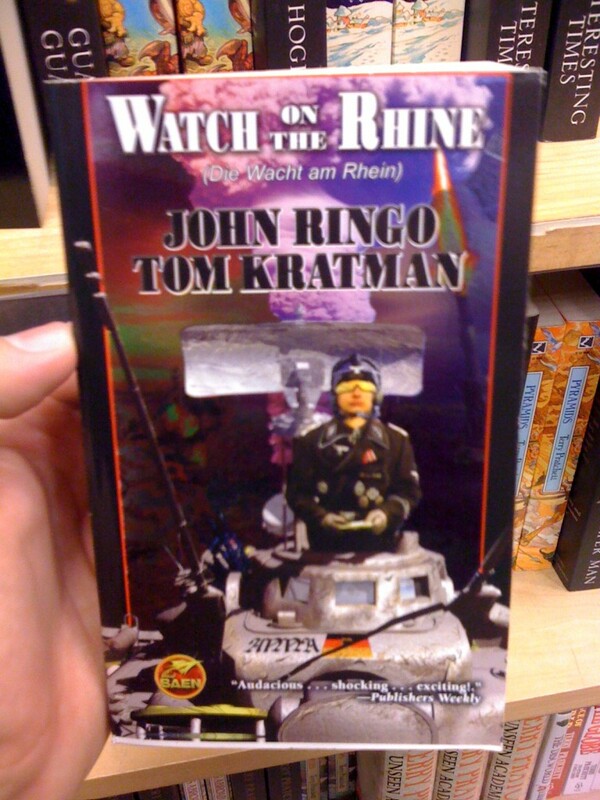 If you google, “Warta na Renie,” which is the Polish translation for Watch on the Rhine, they’ve got a completely different cover, though even more garish. And German covers, generally, are both garish and have not a blessed thing to do with the book. The wife…yeah. Panamanian women are good looking, generally, but she was and is something else. Very traditional family, been ranching the same land for about 400 years. I didn’t get to take her on an unaccompanied, after hours, date until we were married. Somewhat like her 97 year old grandmother (now deceased), the one with the shape of the 14 year old girl, _after_ bearing a dozen children that _lived_; she still has the shape of a young women. Yolanda, even when pregnant was an hourglass with a pot in front. The grandmother, by the way, is Digna in Yellow Eyes. She looked a lot like Yolanda but tiny, blond, French, and with bright blue eyes. Yoli’s mostly Euro – half Spanish, a quarter French, and about a quarter of the local Indian, with some small admixture of Arab or Berber in there somewhere. Between “24” and “The Shield”, you’ll pretty much overdose on testosterone pumping gun fights and drama intersperced with the odd interrogation scene. Worth a watch! I don’t think i’ll mind ADCP too much. I’ve read a few reviews now and it seems again to have attracted more than its fair share of controversy. I honestly think i’ll fall into the category of people who disagree with its political message, but you have given me fair warning. I also think it won’t have quite the same effect on a UK reader as it would on a US reader, since i have no allegance to democrat/republican party or anyone else for that matter. I think i’ll still be able to enjoy it for a good novel. I really like the Lotus Eaters piece of artwork, especially the top half (pretty grusome). It looks 3D rendered. Still not convinced i like the style of art in general on a book cover though. When you read the book, if you do, it may appeal more. There’s no republican or democrat in the books. I think the only parties mentioned, or ireasonably inferable, are the Federalist (US), Progressive (US…and, I suppose, those are close to some notion of Dem and Repub, but Progressive is more openly social democrat while I never did lay out a platform for the Federalists), the Tsarist-Marxist Party (Volgan Republic), and the Legion and the Oligarchs (neither of which have a party name) in the Republic of Balboa. There’s also, in The Lotus Eaters, a series of epigraphs taken from that well known 25th century text, Historia y Filosofia Moral, by Jorge and Marqueli Mendoza (the real Marqueli is my wife’s cousin and she’s perfection in miniature). Oddly enough, and personally I consider it very odd, the main character, Carrera, will have ended up setting up a state that is, on the one hand, highly timocratic, a la Heinlein’s Starship Troopers, but also heavily socialized. He didn’t intend to. The road that got him there is one that no self-respecting socialist would care to trod. But it was also fairly inevitable, in context. Feel free to jump on the bandwagon and add a few witty comments in a few of our other threads. Theres bound to be a cover or two in here that make you smile. Addendum: I don’t post on Asimovs anymore, though I occassionally follow the threads. Long story. I do post on Baen’s Bar – http://www.bar.baen.com – quite a lot and the lot of you can consider yourselves invited. Note, however, that the Bar tends to be either right wing or libertarian and with an amazingly military bent. There are a few exceptions – 1632 Tech and Mutter of Demons, say, though even they tend to be somewhat militarized – but that’s the overall trend. Militarized? I’ll put it this way: I’ve got fans who post there from the US Army, Air Force, Navy, and Marine Corps, the Russian/Soviet Army, the Israeli Army, the German Army _and_ Navy, the Canadian Army, the Australian Army, the Croatian Army, the Greek Army, the British Army, some odd Private Military Corporations – I’ve got infantry, armor, artillery, engineers, air defense artillery (notably one Russian and one Israeli), MPs, Tranportation Corps…you get the idea. Hell, everytime there’s a war I lose sales because my fans are fighting in it.